BMWs generally had below average warranty repair costs in 2003 Warranty Direct Reliability index (index 81.41 v/s lowest 31.93). Link:- www.reliabilityindex.co.uk 2001 - 2003 models rated average for breakdowns, problems and faults in 2003 Which survey. 23rd from top car out of 137 in 2003 Top Gear survey. 8th top model in 2004 JD Power Customer Satisfaction Survey. 98% of cars up to 2 years old breakdown-free over previous 12 months in 2004 Which? survey. S and T reg cars came 9th in 2001 Top Gear / JD Power Customer Satisfaction Survey. Improved unlimited mileage two year full manufacturer warranty followed by one year full dealer warranty from November 2001, making total three year unlimited mileage warranty. BMW, Toyota and Ford jointly suffered the fewest breakdowns attended by German ADAC during 2001. 5th Top in 144 car 2002 JD Power / What Car? Customer Satisfaction Survey of V and W reg cars so seems to be improving. BMW had sixth lowest average cost in warranty claims for cars up to 10 years old in 2002 Warranty Direct index. 10th = overall in 2003 What Car? J.D. Power Customer Satisfaction Survey. Came 6th from top in 2005 JD Power/What Car Survey of 23,000 cars reg Sep 2002 to Aug 2003 with satisfaction score of 84.3%. 13-1-2013: Reader reports having averaged 41mpg over 22,145 miles in 2001 BMW 530D (M57 engine) From March 2013 to January 2014. Have been quibbles about build quality and paint. Dodgy door seals. Wipers set for LHD. Old 2.5 litre diesel not significantly more economical than petrol, so best avoided. V8s not worth the extra. 2.8iSE and newer 3.0iSE is as far as you need to go. Franchised dealers know how to charge. Electrical niggles reported, including faults with ventilation and air-conditining system, airbags, park distance control. Engine gasket leaks. Problem with combined navigation and telephone system of facelift E39 from Y2k. Excess rear tyre wear can cause Steptronic autoboxes to stick in a lower gear after ascending an incline. M5s come with no emergency wheel, but 17" space savers for 3-Series can be modified to fit. Only 89% breakdown free in 2003 Which survey. 1995-1997 petrol rates average for breakdowns and faults, poor for problems; 1998-2000 petrol rated average for breakdowns and problems, poor for faults in 2003 Which survey. Replaced by E60 October 2003, but E39 Touring continued for 9 months. Build date from 2001 shown on engine compartment label on top of front nearside wheelarch. Uneven rear tyre wear and clonks from the rear can be caused by worn rear suspension bushes. Reports of repeated thermostat problems blowing radiators on older E39s. Flat spots of and lack of power or M47 and M57 diesels due to a known problem with the wire mesh air mass sensor. When replaced, must reprogramme ECU to match new meter. Lack of power also caused by cracked inlet manifolds. Misfires of M47/M57 caused by failed injectors. Turbo trouble with early 530ds caused by ECU programme allowing higher boost than safe for turbo. Cured by replacing turbo, reprogramming ECU and thoroughly cleaning turbo inlet manifold and pipework because a blockage can cause the engine to run on its sump oil and self-destruct. If M54 engine management light comes on could be faulty throttle housing plug on later cars (requiring new engine wiring loom) or split crankcase breather hose or split diaphragm in cyclone separator on earlier cars. Coolant loss and overheating of M62 engine could be due to failed water pump, failed valley gasket under inlet manifold or cracked/porous block. 17" wheels easily damaged on inner rim. Brake pipe corrosion in area over fuel tank becoming common. Older cars plagued by electrical problems: failing lcds, etc. M52 520i six 523i six, 528i six to September 1998 may suffer premature bore wear due to high amounts of sulphur in some UK petrol. Solved by replacement block with steel-lined bores on sixes. Production from September 1998 fitted with 'EU3' steel-lined bores. 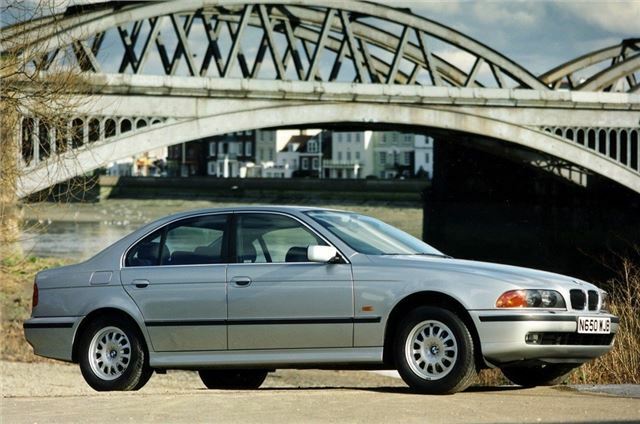 (No such problems with newer 525i and 530i six cylinder engines, and no problems with M62 V8s in the E39). If buying a 6 cylinder car, particularly a 523i, from a dealer insist on a new MOT because the emissions test will show up potentially expensive catalytic converter failure. Check took kit is all there. Service light indicator can easily be re-set, so a paid invoice is the only guarantee of a recent service. Odometer LCD readout prone to fading. Costs £500 to replace. General Warning about Automatic Transmissions: Many BMWs have "sealed for life" automatic transmissions. Regardless of whether you have a full BMW service history, the dealer will never change the auto fluid. Many of these boxes are failing around the 120-150k mark - often well outside of warranty and to a cost of £3.5k plus VAT. A good independent or automatic transmission specialist can and will change the fluid for you (and any good BMW independents will recommend this anyway). This is commonplace in the US and means the 'box should last the life of the car rather than being the cause of it being written off. General advice is ensure the fluid is flushed out every 60k or more preferably at each Inspection II. However, one specialist says autoboxes do not take well to being drained and having their ATF replaced. Many instances of wheel wobble or judder after tyre changes. Possibly curable by having the wheels and tyres balanced on the car. Repeated ECU failures reported on 528is. On 525 and 530 diesels, inlet manifold swirl actuators prone to breaking off and being ingested by the engine, causing terminal damage. If airbag warning light comes on the fault is usually with the passenger sensing mat in the front passenger seat, usually the connection, but, once fixed the ECU needs to be re-programmed to clear the fault code. Alarm system Body Control Module (BCM) can revert to "Shipping mode" and not respond to the remote. A good specialist can recode it. But some BMW dealers want £230 plus VAT plus fitting for a replacement module. Another reason for alarms sounding is failure of the bonnet sensor. This is a poor piece of engineering with exposed contacts. Temperature changes, such as night time cooling and hot sun, cause the bonnet to flex, which sets the alarm off. Replacements cost £8.50 and are easy to fit. Battery drains can be caused by the heater thermostat fan resistor (called a +ACI-hedgehog+ACI-because that's what it looks like). Best advice is to turn the heater fan off completely overnight, just push the minus side until it reaches minimum and then one notch more it switches off completely and the panel illumination goes out. The resistor itself can be accessed by removing trim to get to the back of the heater controls. It is not necessary to dismantle the whole dash. 20-1-2011: If the autobox starts changing up and down of its own accord, try disconnecting the battery, leaving it disconnected for 12 hours, then reconnecting. That reboots the transmission electronics and can solve the problem. 24-6-2011: Autodimming door mirror glass progressively turns a murkey brown after ahving been subjected to very low temperatures. Cost £300 each to replace. 5-1-2013: Some 1996/97 540i models had a Residual Heat Utilisation feature linked to the air conditioning system. This allows heat stored in the engine to heat the interior when the ignition is switched off. The by-product is that the heating system piping is much longer than normal, and there is a booster pump to help push heat round the system. Unfortunately the system can fail, leaving even very good BMW specialist baffled. 18-2-2014: Numerous age-related problems on a 125k mile 2002 E39 530i auto, including replacing both upper control arem joint rubbers, replacing aux belts and replacing rear flexible brake hoses. 10-9-2017: Warning of fumes build up from secondary air valve of 1992 E39 BMW 523i meaning that exhaust gas was continually being forced down into the secondary air pump and into the driver’s side wheel well. This gas was then finding its way into the car making the driver drowsy. 20-7-2018: Complaint of brake pedal of 2002 BMW E39 M5 sinking to the floor ever since ther car was new. Car always service by BMW agent. Brake discs, pads and calipers all replaced. Master cylinder replaced. Yet brake pedals still sinks to the floor, particularly after light throttle openings. Might be something to do with the servo assistance, but failure of that would usually lead to a hard brake pedal. 15/12/1999: (E39 built Sept/Oct 1999): brake light switch may fail leading to brake lights flickering or failing and switch overheating. New switches to be fitted. 9/11/2001: Cars built 28/9/2001 to 24/10/2001 with Continental tyres may have cuts in the tyres which can lead to blowouts. 16/11/2001: 5-Series diesels and V8s built 11/11/2000 - 30/9/2001 recalled because fault with radiator fan motor could lead electrics to overload, fan motor to fail and a small electrical fire to result. w/e 23/2/2002: recall in Germany for all models fitted with Conti Eco Contact and Sport Contact 205/55 R16 and 225/55 R16 tyres due to a pressure problem. 22-2-02 Bearing in front strut top mountings may be displaced if car is jacked up. 2023 cars affected. 1-11-3003: on 8,183 cars microprocessor in airbag control unit could develop a fault leading to airbag going off when ignition key is turned. Replace with re-coded unit.